Electro Kinetic Technologies developed a custom solution for a manufacturing client with a uniquely elevated process that required workers to use tools and materials several feet above the ground. The elevated track structure was designed by others from lightweight and minimalist materials in order to accommodate the cost and space requirements of the customer. The simple design for supporting the cart consisted of two flat surfaces a few inches wide each plus the needed structure for support. Structural tubes 10” high running the length of the track on both sides also doubled as a “fence” available to keep the cart on track so it could not fall. 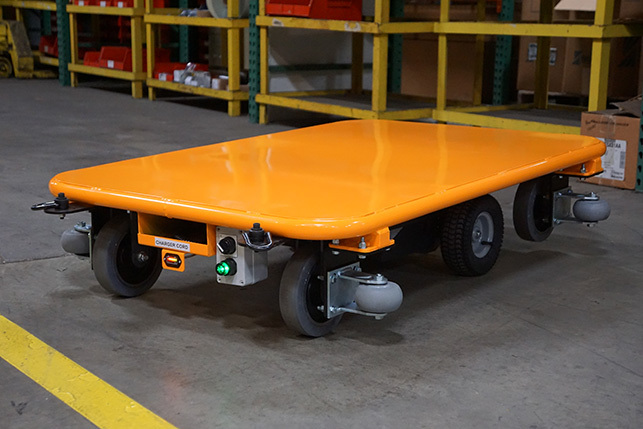 In order to allow the cart to operate safely on the elevated track, which does not present a suitable walking surface, Electro Kinetic Technologies built the cart for wireless control by an employee at a safe distance away. This addition included clearly visible indicators for battery charge level and for whether the cart was powered up. For initial installation and periodic servicing, our engineers added hoist rings on all four corners of the cart, which allowed for easy lifting of the cart on and off track. Guide rollers were installed at the four corners of the cart and run along the fence to keep the cart operating safely without leaving the track. For that same project, our engineering team accounted for the possibility of imperfections in track structure by providing spacer plates for adjusting caster height, guide roller height, and width wise location. For additional information on custom solutions to your material handling challenges, contact us and a team member will help answer your questions.